Original Builder: Isaac Bell Jr. The decade between 1870 and 1880 was a critical time in the evolution of American domestic architecture. The Picturesque tradition inherited from Great Britain and Europe transformed American design. In the 1860s and 1870s, British architects such as Richard Norman Shaw and Philip Webb drew from elements found in old English houses from the 16th and 17th centuries, and modified them to create a new style, which would come to be known as the Queen Anne Revival. In America, the architectural firm of McKim, Mead & White were inspired to do the same and looked to colonial American buildings for inspiration. Many of the colonial buildings of New England had a direct impact on their quest to design a truly “American” style of house. 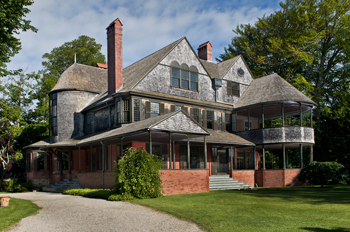 In 1881, Isaac Bell hired McKim, Mead & White to design a summer house on Bellevue Avenue. The commission reflects the highly experimental nature of the firm’s work during the early phase of its prolific history, and resulted in the creation of one of the most influential buildings in American architecture. At the time of its completion in 1883, the Isaac Bell House was revolutionary for its open plan and fusion of design elements from a variety of historical and exotic sources. 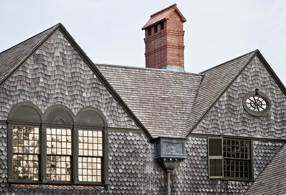 The architects used many historic features from colonial America, Britain, Europe, and the Far East, but they were not dependent on historical references. Instead, they were inspired by it and used historic details and building materials in innovative ways. The exterior of the Bell House is one of McKim, Mead & White’s most sophisticated and unified designs. The facades of the building are composed to create a picturesque effect with towers and gables, drawing upon the popular picturesque tradition, but using the elements in a much more complex way. On the Bellevue Avenue side, the whole facade is organized under two sweeping gables, inspired by colonial American buildings. The curved shape of the two-story porch is inspired by medieval towers, and the single-story piazza wraps around the remainder of the building as the important feature that ties the facades together. The bamboo style posts are inspired by Japanese designs. The Renaissance portrayals of dolphins on the porch brackets is modeled after Italian Renaissance dolphins, and reflects the diverse sources of ornament used by the architects. Most house museums showcase rooms with period-appropriate furnishings. While the Bell House features some furniture and decorative objects, the presentation is focused primarily on exploring the unique and experimental nature of the floor plan, ornamental details, color, light, and the story of preserving the house. Interpretation is based on three themes: American architecture, American social and cultural history, and historic preservation. Central to the house is a large living hall with an inglenook hearth. Oversize doorways connect the living hall to the other rooms, allowing the first floor to function in two ways: as individual rooms or as one large entertaining space. This idea of free-flowing interior space, taken from Japanese architecture, was revolutionary for America in 1883. The inglenook, or fireplace corner, incorporates antique woodwork from the Brittany region of France, reflecting the architects’ interest in folk art and rural architecture throughout Europe, Asia and America The door rollers for the drawing room are based on Colonial American barn door rollers but are decorated in a Japanese style. The use of rattan on the walls in the dining room shows the architects’ interest in the Far East and modern materials. Antique bed warmers were mounted in the frames around the room. The influence of the Colonial Revival is evident in the door tracery – curvilinear openwork shapes comprising a pattern – on a bedroom cupboard. Stained glass in the stair hall combines circular bottle glass and a wave pattern reminiscent of Japanese design. A Chinese fret pattern incorporated in the fireplace mantle shows the influence of the Far East.